So, it has been a hot, very hot, minute since I’ve written in this blog. I know this. Truth is, we’ve not been walking and when we did, it was for just a bit and all the places we’d been before. Nothing new and nothing to talk about. But, I realized that this isn’t the point. The point is about health first and foremost. It doesn’t matter how little we walk or if we’ve been there. It’s a combination of chronicling, exploring, health, and personality. We may get lucky and hit all those points in a week, but we know we won’t for the most part. We need to write and be accountable for the job we set out to do, right? I think so. Another thing is that with the weather so unbearably hot during the summer, in conjunction with me playing gigs on Friday nights, it was miserable to get up and walk in those conditions. So, we didn’t. And, we won’t. But, now, the weather is cooling down and fall is coming. We can get back to business. Even in the winter, it’s not too bad. We can always add layers. That’s what we’ll do. Summers, though? Nah. Well, today we started our comeback. or at least our reentry into the lifestyle. We were determined to just get our “walking legs” back under us and that’s what we did. And, if we were going to do that, why not do it in one of our favorite places in town? Why not do it in one of this city’s most famous gems? Why not Old Salem Museum and Gardens? Why not indeed…? Stephanie and I have tried to do the “10k by 10a” since I realized it was much easier to walk in the morning when it was cooler and before our day was interrupted with misery. We found that it was easier to do that and the misery was to a minimum. But, we also know that in these early stages or re-entry, 10,000 steps is a lot to throw on my large body. We have to, as I said earlier, ease back into it. I’m writing this post at 1:18 pm on Saturday and as of now, we’re sitting at just under 5000 steps. I think that was an honorable start. We will get closer or upwards of 7500 by the end of the day, I feel. We parked at the parking lot of the Cobblestone Farmers Market in Old Salem. Spent a little time talking with a few of the vendors, including Gnomestead Hollow and the Official Pickle Sponsor of The Less Desirables, Niki’s Pickles. We walked up to Main Street and walked north, where Stephanie dispensed some knowledge of Old Salem to some wonder wanderers. We went through one of the twin alleys over to God’s Acre and then turned south on Church Street back to Race Street and then back up to West Street where we turned, well, west and back to our vehicle. We left there and drove to Trade Street where we had breakfast at Mary’s Gourmet Diner, our Official Carb Loader. We then rode to Underdog Records and spent some time with some of our record collecting pals. So, it’s still early in the day and I will have some steps in from record washing and just walking about. It wasn’t 10k steps but it’s a great start, we believe. Thank you to Omega Sports for the awesome Brooks shoes and Thorlos socks. You can get all your walking equipment needs at Omega Sports. They are the sports hook up for the everyday active types. Thank you to Mary’s Gourmet Diner, Twin City Hive and Hoots Beer Company for sponsoring us and caring about our best health. Go out there and explore our city! We decided to do something a bit different this trek. I have lived where I live for over 30 years. Stephanie has lived with me for six of those. In all those years, I haven’t done a lot of walking through the neighborhood. Truth be known, I didn’t even know what neighborhood I actually live in. I always thought, looking at antiquated maps of the city that I lived in Hootstown. However, in looking it up and researching, I have figured that I live in a neighborhood called Sentry Pointe. I like that name and I know where Sentry Pointe is, but I don’t know why it extends over to my house. Oh well. So, with the weather being in the frozen tundra range Saturday morning, we didn’t start our walk until almost 9:45a so we obviously didn’t make the 10k by 10a but that’s just a goal, anyway. Even at that time it was pretty cold. We went southeast on Gyro Dr. and to Old Salisbury Rd. where we turned south. It’s a very narrow bit of ground between the street and the front door/fences/cars of other folks on Old Salisbury. It’s obviously not meant for walking, although there are plenty of people that do. It was a rough and unlevel terrain that we had to traverse and it was wearing on my ankles after a while, even after some stretches. We walked south until we reached the traffic circle on Ardmore Rd./South Park Blvd. We turned west on Ardmore. More of the same terrain was there. We tried to walk on the actual street as much as possible but it is a well-traveled pair of roads. Luckily, Ardmore has more shoulder space than Old Salisbury. There is also a stretch of Ardmore that has a sidewalk. It’s only about a quarter of a mile. We continue along Ardmore Rd. until we get to Park Terrace Ln. where we turn north. Park Terrace Ln. is a relatively new development, built within the last 20 years. Some of the houses are only around 12 years old. We continued on Park Terrace until it bends west and to Hawkcrest Ln. We took Hawkcrest north until we hit Gyro Dr. south. We took it east and back to where we started. This area, the best I can tell, is some of the “youngest” areas of Winston-Salem. I know that when I moved here 30 years ago, it wasn’t actually within the city limits. That didn’t happen until a few years later. Given that, there’s not a whole lot of interesting things to see or really even remark on about this area. In fact, it’s a very boring part of town. It’s quiet and not a lot goes on around here, which is ideal for living, really, but, that’s about it. There were a few interesting things we did see on the trek. First, were two ducks that Stephanie remarked that they were competing to see which was going to tell us their joke. It was funny. We just called them, “MR Ducks” and continued on. Another thing was this ridiculously large reindeer that was in a wide open patch of land right beside an equally large light tree. I’ve never seen that before. We laughed and moved on. Between the cold and the fact that both of us needed the facilities plus we were pretty much out of walking real estate, we stopped at about 7800 steps. So, no we didn’t make the 10,000 goal. But, the day went on and at the end of the day we had 9,275 steps. We walked 4.73 miles and I burned 3,289 calories. After we walked, we went to our Official Carb Loader, Mary’s Gourmet Diner. 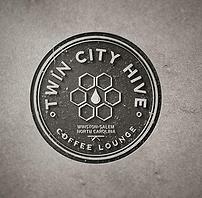 From there we went to our brand new coffee sponsor, Twin City Hive. We had a party to get to so we didn’t get to make it to our Official Liquid Reward, Hoots Roller Bar & Beer Company, but I am ready to go grab one of the new “crowlers.” I cannot thank my sponsor, Omega Sports enough for the most comfortable walking shoes I’ve ever had and the Garmin Vivofit3 that keeps track of all my progress. Many thanks to all of my sponsors for everything they do for, and believing in, me. Do you have a recommendation for a neighborhood for Stephanie and I to walk in or talk about? We’re always looking for new places and new areas. Partly because we could be in the market for a new home in the near future and like to scout the different areas around time. Let me know by sending an email HERE. I apologize to my readers and sponsors for not posting more, but I’ve still been getting into the groove of walking again. That ingrown toenail did a lot of damage, more than the pain, but the downtime. Thanks doc, I know it’s for the best. Over the last three weeks, for various reasons, Stephanie and I have been walking the downtown area, some (most) in places we’ve already walked. It’s mostly a steady, consistent walk, in familiar territory and we had things going on in the area; it was convenient. Plus, no matter how many times we walk this area, there is so much history that we learn something, see something, or find something we didn’t know or know about before. much on a city excursion. And, stretch. Stretch. Stretch! Your muscles aren’t made just get out and go. You have to work them up to that, even a rudimentary thing like walking. Moving about isn’t too strenuous but I learned the hard way this weekend, don’t take it for granted. Let’s talk about the journey this week. We parked on Fourth Street and walked east to Research Parkway. We turned north and walked by the area now known as Plant 64, a former tobacco plant dating back to around 1916, that has been converted into a luxury apartment community and some office spaces. We walked to Fifth Street and stopped. I was already feeling the affects of being slightly dehydrated and not stretching. We turned west and walked Fifth up to Main Street. On that segment, we passed by the lovely Bailey Park where the Wake-Up Walk happened for Family Services. We missed that one as we got a late start on the morning. We already knew we weren’t going to make the “10k by 10a” goal, but we were going to go for as long as we could. We weren’t lying in bed being lazy cusses and that was the important part. Stephanie, who used to work in Old Salem said she’d like to at least get close to the area to see if the leaves had turned, yet. Incidentally, I do recommend you get by Old Salem in the next week or so as the leave will start really turning by then. little happening in this city. It could be just any other small town. Next to it is the “box the RJR Building came in,” the old Wachovia building, or the newer Winston Tower, the second tallest building in town. We continued south and passed the new “Wachovia” building, now known as the Wells Fargo building after passing two very miserable places. The Federal Courthouse and the Hall of Justice. Both are courts of law among other things. Both are eyesores of this city and both hold a lot of bad stories, bad people, bad memories and bad incidents within their walls. I know they’re needed but they’re just miserable places and being betwixt them is depressing. Luckily, they were washing the exterior of the Federal building and that gave us something interesting to look at as we passed by them. We passed down into Old Salem and walked until we got to West Street and well, we turned west. We stopped by the Cobblestone Farmers Market, a delightful collection of farmers, growers, makers and retailers of locally produced wares. There’s something for just about everyone there. After stopping, talking to a few merchants and resting our non-stretched bodies for a few minutes, we went back east on West, through the Old Salem Square, where there was an artistic gathering of local or at least moderately local artisans selling their wares. We turned east on Academy Street and north on Church Street. Going north on Church leads you to God’s Acre, the Moravian graveyard. Old Salem, itself is something I could write twenty blog posts on. Beautifully restored and curated homes (privately owned), period-authentic costumes, an authentic bakery, a hat shoppe, history, fables, truths, all there in Old Salem. If you’ve not been or haven’t been in a while, you owe it to yourself to pay the entrance fees and do some touring. If you live here in Winston-Salem and haven’t done it, shame on you. It’s fantastic stuff. Stephanie worked in costume there for many years, so I get the cheap tour, but we don’t get to go into the houses and exhibits. We have done that and she tells me about them all the time. Sporting our “We Voted Early” stickers. I’m lucky. You should go do the tours, I’m going to leave it at that. Still slightly suffering from the effects of not stretching, most of it had worn off by then and I felt decent, we stopped at the Vierling House (closed for renovations) for me to prepare the long walk through God’s Acre, by sitting on the bench outside of it. We then passed by many rows of plain white grave markers, some going back to the late 1700s. In past weeks, we visited the city cemetery, home of many of Winston-Salem’s famous founders’, industrialists’ and favorite families’ (Reynolds, Hanes, Babcock, Vogler, etc.) for their eternal resting places. That is just on the other side of God’s Acre and it’s very interesting to visit all of the graves there in both cemeteries. You could make a day out of the city cemetery alone. worth it. We were sitting around 8000 steps at that time. After finishing up there we continued north on Chestnut until we got back to Fourth, turning east and back to our car. We drove over to our official “Carb-Loader,” Mary’s Gourmet Diner and after noshing on her lovely wares we walked up to Atelier on Trade (which I believe now wants to be called Atelier Bakery on Trade), our official “Caffeinator,” for a couple of coffee drinks and then over to our “Liquid Reward,” Hoot’s Roller Bar and Beer Company for our just desserts. We ended up walking a little more throughout the day and ended up doing 11,524 steps, equalling 5.74 miles and burning 3349 calories. I’d like to remind you to visit my sponsor, Omega Sports for your walking/running/sporting needs. Again, they carry Camelbak products as well as the Garmin Vivofit3 and Brooks shoes. I’m thankful to them for getting me out and walking. I want to reiterate the importance of the stretching and hydrating, though. I mentioned it only a few times here, but it was extremely difficult to do the walk and I was cramping, a lot. I have some weird muscles that tighten up on the outside of my legs, slightly above the ankles, and it affects my gait which, in turn, affects my back. I was a sore man at the end of the evening. I didn’t sleep too awfully much either and that is also important, not only for walking but for everyday life. Take care of your bodies folks, eat well, drink lots of water and stretch! Thank you for reading. It was good to get back to the walking grind after being out of commission for over a month. In my last post, a few weeks back, I talked about missing because of a doctor-imposed hiatus due to an ingrown toenail. Admittedly, I was kind of dreading walking because I got out of routine, out of shape (not that I was in shape) and have been battling an allergy/sinus problem. So, to combat that, we decided to go a little easier on our walk the first time out, just to get back into it. Stephanie and I got a later start than normal on this Saturday and luckily, it wasn’t too hot. We decided to something familiar to do our “easing back.” That ended up being downtown, of course. We parked in the lot around our “carbinator,” Mary’s Gourmet Diner and walked Trade Street, south to Seventh Street. We walked Seventh, east, all the way to Patterson. We passed the Goler AME Zion Church on the corner of Patterson and Seventh. The church was built in the very early 1900s and was very instrumental in the African American community, especially in the era of the tobacco boom of the early 20th Century. It has been on the National Registry of Historic Places since 1998. Speaking of the tobacco history of this town, Patterson Avenue is the location of the new Innovation Quarter that is a lot of Wake Forest University, a lot of other technological and innovative companies, incubators and research facilities all combining forces to make the world a better place. These are all either demolished, refurbished or completely reimagined tobacco warehouses. You can stand on the corner of Patterson and Sixth Street and see one of the most spectacular views of the city (see the picture) . We walked south on Patterson, by the beautiful Bailey Park to the developing area of Third Street, right behind Krankie’s. We turned, west, up the hill at Third and walked that past the oldest “skyscraper” in the city. In fact, it’s older than the city itself. The towns of Winston and Salem merged in 1913. The building of 8 W. Third was completed (mostly) in 1911, two years before the city was established. It was built as the headquarters of Wachovia Band and Trust and served in that role until what is now Winston Tower was completed in 1966, basically, right across the street. It was added to the National Registry of Historic Places in 1984 as “Wachovia Bank and Trust Company Building.” That’s history! Also in that area? The old Forsyth County Courthouse. It sits, officially at 50 W Fourth Street (though the National Registry of Historic Places lists it as 11 W Third), directly across the street from 8 W Third. It was the third courthouse to sit on that spot, completed in 1926 and updated in 1960. It continued to be used for county services even after the Hall of Justice (I always think of the Superfriends when I say or hear that) was implemented in 1974. It made the Historic Places list in 2013. There’s a lot of the town’s history in that one little block. We went north on Liberty, so named because a former resident of Salem moved out and felt “liberated” to be free of the rules of the Moravian theocracy. We made a stop by the new Crafted: Art of the Taco, which I can assure you will be covered on The Man Who Ate the Town, very soon. Again, we knew we’d be taking a lighter load for the day to ease back and I was working on about 3 hours of sleep, so we made our way to Martin Luther King, Jr. Blvd. and turned west. We took that past what will be Wise Man Brewing and the old Ziggy’s. I can’t wait to tour the new brewery to see how much of this large building they will actually be using. It seems a bit large for what they’re doing, but that’s not a bad thing. We walked MLK until we hit Trade again. We walked south and stopped our journey back at Mary’s. After having our breakfast there, we made our way down Trade to our official “caffeinator,” Atelier on Trade. Right before we made it to the store front, we hit 5,000 steps. So, half our normal steps at a later time of the day. We still felt good that we got out and was moving about. We finished our walking Saturday at our “liquid reward,” Hoots Roller Bar and Beer Company. Counting our minor walking about to get a prescription filled and to dinner, we ended up with 6,751 steps, 3.35 miles and burned 3094 calories. This according to my Vivofit, courtesy of Omega Sports. I’ve been working on the videos that will accompany some of the walks, for the web series. That’s part of it. The other part is for the last 2 weeks and into this week and possibly the next, I’ve been nursing an injury. Nothing that was completely off the charts, but I had an ingrown toenail and it was quite painful. I had it removed and the doctor said I couldn’t do my “10k by 10a” for a few weeks because he didn’t want me pounding the toe. It’s healing up nicely and I hope to get back to doing my ‘thing’ in just a few more weeks. I do have some journeys that I need to update, I just need to get to it. In the mean time, I would like to thank my sponsors, Omega Sports, Mary’s Gourmet Diner, Atelier on Trade and Hoot’s Roller Bar and Beer Company for their continued support and understanding. Stephanie and I were up early this day, knowing that there were other things we’d be doing in the day and that it was going to be very hot later that afternoon. So we had decided that our “10k by 10a” quest would be Buena Vista this day. Yes, we’ve been to that area a couple of times and we’ll continue to go there. There’s a large neighborhood back in those side streets and plenty that we haven’t explored. We started our journey (with GoPro from Omega Sports strapped on) at Five-Points on North Stratford and we headed north. We observed some wonderfully rich architecture and I’m not just talking about the folk or houses that made up the neighborhood. I mean the the way the houses were constructed and the history in this neighborhood is quite rich and deep. We walked all the way to Spring Garden Road and turned west onto Spring Garden. We walked that until we got to Sylvan Road. We turned south on Sylvan and walked until Greenbrier Road. We walked Greenbrier southeast to Roslyn Road and turned south. We walked Roslyn to Buena Vista Road where we turned northwest until we reached Dartmouth Road. Stephanie had attended Whitaker Elementary for a time and wanted to show me where it was. I say was because it had been torn down and a new one built on top of the old place. So there were stories about boys that picked on her to be told. We walked Dartmouth south to Forest Drive where we turned east. We walked Forest until we returned to Roslyn. We walked south all the way to Warwick Road, which we took east, crossing back over Stratford and to Runnymede Road where we turned southwest and back to Five Points. We needed to get a few more steps so we walked back up Stratford until Warwick and crossed the street to come back to Five Points, and crossed Country Club Road and onto S. Stratford and around the BB&T building’s parking lot to reach our car. Just as my watch chimed 10,000 steps it also showed that it was 10am on the dot. We went downtown to Mary’s Gourmet Diner to have our after-walk nourishment from our official “Carb Loader” and then down to Atelier on Trade to our official “Caffeinator.” Afterwards, it was time for our “liquid reward” at Hoots Roller Bar & Beer Company. But, our day wasn’t done. We then went to RayLen Vineyards to perform with the Vagabond Saints Society and then after that, we went back to downtown WSNC to perform with Clay Howard at Finnigan’s Wake. All-in-all for that day, we ended up with 17,410 steps. That equaled to 8.47 miles and I burned 3546 calories. Not a bad day of walking, I’d say. Many thanks to our sponsor Omega Sports without whom I’d be on old tattered shoes and bad socks, and have to resort to checking my phone instead of my Garmin Vivofit 3. They make the walks possible. While N Stratford is a bit noisy (it’s a pretty busy street), the neighborhood streets to the west of it are very quiet, serene and beautiful. There are plenty of wonderful houses, buildings and structures to gaze upon as well as magnificently manicured lawns and landscapes to enjoy. It’s one of the more upscale neighborhoods in town and it shows. But, they seem very inviting to others who may be wandering about their community. We thank them for their welcome hospitality. Look for this to be a video soon (at least that’s my plan).